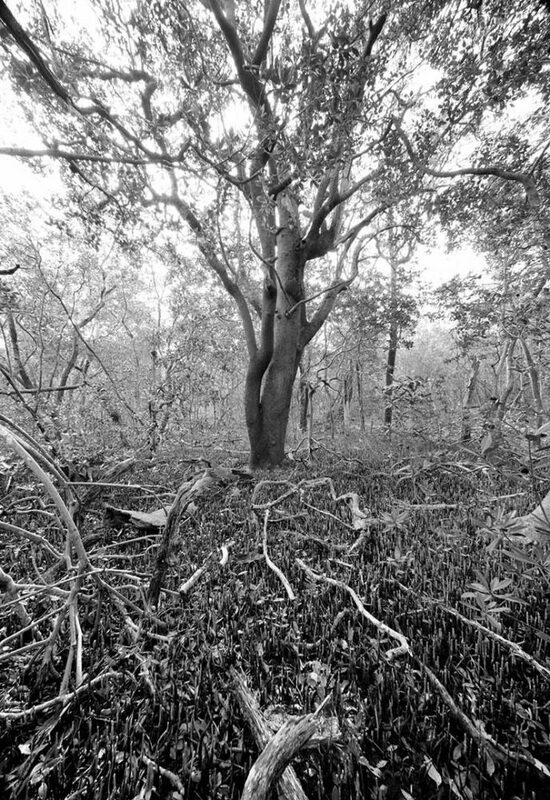 Photographic Story Mound Key Archaeological State Park, Estero, Florida – This is the tallest Black Mangrove in Florida. It is located on the highest spot in South Florida at 26 ft and it’s not easy to reach! In order to get to it, I climbed over an Indian Mound, lots of small Black Mangroves, Red Mangroves, sunk in the muck several times, and struggled not to inhale mosquitoes. It took the majority of the morning to reach the site, but the beauty of the mangrove was worth the struggle. Analog – Archival Silver Gelatin Photograph Clyde’s silver gelatin black and white images are created using an 8” x 10”, 11” x 14”, or 12” x 20” view camera. Clyde prints his images in his own darkroom on fiber-base paper in a limited edition. The photographs are selenium toned, then mounted and matted to current archival standards. His images come in sizes from 8” x 10” inches to 5’x 8’ feet. His love of art and nature is seen in the exceptional detail and more subtle textures of his photography. Each photograph is individually hand printed in the darkroom and will vary based on factors such as artist preference, chemistry and temperature. The image displayed on the website is a digital scan of the original negative and should be considered a representation of the printed version of the art.